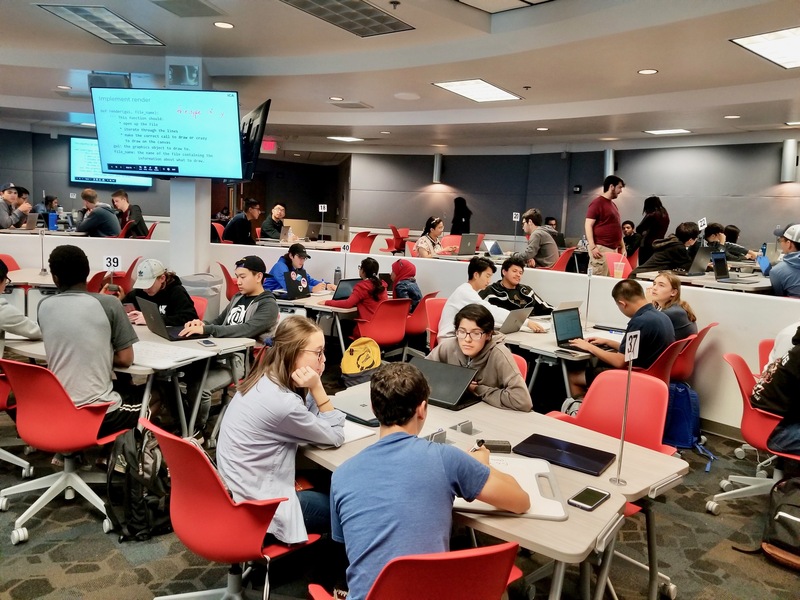 The University of Arizona has made huge strides in fostering collaborative learning by providing innovative learning spaces throughout the campus. With a commitment to developing a wide-variety of centrally-scheduled Collaborative Learning Spaces (CLSs), students are beginning to experience active learning strategies in the classroom. Computer science instructor Benjamin Dicken is one of several CS faculty incorporating active learning in his classroom. In CSC 110 - Intro to Computer Programming I, class time is spent on a mix of short explanations of concepts, in-class activities, and follow-up on these activities. Multiple times per class meeting, students are given short activities to work on in their assigned groups. These activities allow time for the students to apply new concepts in-class, and potentially face their misunderstandings. If students have a misunderstanding, or just don't know how to get started, the teaching staff is available to help get them on the correct path or clear up uncertainty. Dicken also emphasizes that when students work in groups, they are able to peer teach. A student who has a good grasp on a concept can help others in their group. In addition, students can learn how to work with others. The changes made to teaching and learning quality has not gone unnoticed. Students have had a positive reaction to the new teaching style stating, “lectures were taught using short and informative slides, with time in between to practice the things being taught in the form of group activities. This helped me understand the material much better in comparison to some other computer science courses I have taken." Another student states, “I really enjoyed the layout of the classroom in the sense that we got the opportunity to discuss topics with our group and learn from each other." Active learning is having such a positive impact on the CS student experience that the department is planning to create a large collaborative learning classroom in the Gould-Simpson building. Having this dedicated space for active learning will allow the department to expand active learning offerings and continue to support innovative teaching in computer science.